What is your passion, your dream, your calling? Within Hope's undergraduate program, you'll find professors committed to helping you find it and become all you want to be and all God has called you to be. We offer a variety of 100% online college classes, online courses, and online programs that provide college students online with the same one-on-one attention you would expect in a traditional classroom. Hope's Graduate Programs offer convenient university online courses, classroom learning options, and online graduate programs that fit the schedules of both working adults and full-time university students. International students from all over the world call Hope their home as they pursue a life-changing education in America. We welcome you to see what a difference Hope can make in your life! 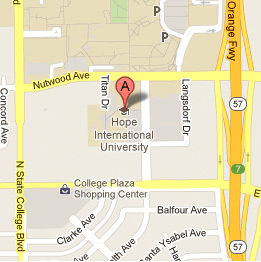 Hope International University is a private Christian university founded in 1928. HIU's mission is to empower students through Christian higher education to serve the Church and impact the world for Christ. HIU is regionally accredited and offers bachelor's degrees, master's degrees, certificate programs, and credential programs to more than 2,000 students world-wide. 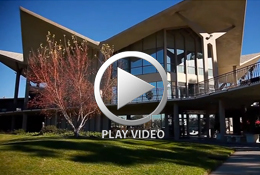 HIU is dedicated to each student’s success through the integration of faith, service and learning.